It was a morning of rumours at Sha Tin. Intrigue abounded as to what the Hong Kong Jockey Club’s Licensing Committee would announce. Between each batch of 10 barrier trials, talk among trainers, jockeys and the ladies and gentleman of Hong Kong’s racing media turned to why the Club had made known as late as the previous evening that a press conference would be held at 9.30 am? It must be something big, they concluded. A cluster of lenses ambushed Douglas Whyte as he walked into the Double Haven suite at the Sha Tin Clubhouse. Gone was the riding gear he had been wearing just a short time earlier: Hong Kong’s 13-time champion jockey was suited and ready for business; a new business. 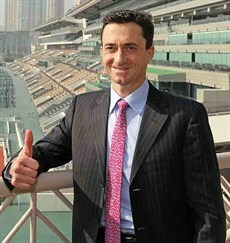 “The Licensing Committee of the Hong Kong Jockey Club has granted a trainer’s licence to Douglas Whyte for the 2019/2020 season,” Andrew Harding, the Club’s Executive Director of Racing, announced. A firm ripple of applause welcomed the news. Harding revealed that Whyte, 47, will hang up his race-riding boots after the Sha Tin fixture on Sunday, 10 February, in order to take up the Club’s offer to join the trainers’ roster full-time at this season’s end. The 13-time champion jockey is looking forward to a new chapter in his career. Whyte said that the opportunity, presented to him at 6pm the previous evening, was too good to turn down; that it fulfilled a long-held ambition but also that it came at an unexpected time. “When I got that call last night, I was very surprised,” he said. “It’s always been a goal of mine to train in Hong Kong and I was hoping that I’d be eventually afforded the opportunity to train here. “I didn’t think it would happen this quickly in my career. I only put in an application recently – for the first time – and I did that in the hope that the Club would take it seriously that I was looking into that venture, and that I would one day be prepared to give up riding. I hadn’t purposed on getting it as quickly as this – but it’s not a hard decision to make. “I believe I’m ready for it,” he continued. “It’s a challenge that I’m very keen to get hold of, and I’m an achiever so any challenge that’s thrown my way I’ll find a way to deal with it. “I don’t think it’s too late and I don’t think it’s too early: It’s the right time,” he said. I always said I’d decide myself when it was time to stop – I still believe I’m sharp, I’m fit, I still have what it takes but when you weigh up what I can now achieve, and what I’m looking forward to, it’s made my decision a lot easier for me. “I’ll still be able to do what I love most and that’s get up and be around horses – fortunately I’m still fit enough to be able to get on them. I’ll miss the competitive side, going down to the gates and analysing each and every other jockey and getting that focus on race day and getting prepared. Before unleashing his first runners next season, Whyte plans to depart Hong Kong to gain experience with some of the world’s leading trainers. And he acknowledged that his experiences up to this point have done much to prepare him for what lies ahead. “I’ve worked with some of the best trainers in the world here in Hong Kong; I’ve worked in South Africa, Japan, Singapore, the UK and been fortunate enough to have been associated with some of the best trainers. I’ve ridden for them, I’ve watched how they manage their yards and run their teams,” he said. Tony Cruz is the only other jockey in Hong Kong’s recent history to make the move directly from race-riding into training and he has so far claimed two Champion Trainer titles and numerous Group 1 races. Whyte is looking forward to following that lead. ** The man who came to be known as ‘The Durban Demon” has won the Hong Kong Derby three times. He has won the LONGINES Hong Kong Cup, Hong Kong Mile and Hong Kong Vase; the LONGINES IJC three times; Japan’s World Super Jockeys Series; he is Hong Kong’s all-time leading rider with 1,813 wins, as well as the record stakes earner with his mounts having collected HK$1.585 billion. The star gallopers he has ridden include Ambitious Dragon, Oriental Express, Akeed Mofeed, Indigenous and Glorious Days. The Licensing Committee also granted a trainer’s licence to John Size for the 2019/2020 season and determined that he would remain eligible to continue to be licensed until the 2023/2024 racing season inclusive provided he continues to meet the criteria set down by the Club. “The Licensing Committee’s policy is that elite-level trainers may be granted a licence beyond the age of 65. Having commenced training in Hong Kong during the 2001/2002 racing season, John has been crowned Champion Trainer on a record 10 occasions. In all bar one of the 17 racing seasons he has since completed, John has been in the top 5 on the Trainers’ Championship in respect of wins and/or prize-money earned, Andrew Harding said. "While renewal of trainers’ licences are normally considered at the Committee’s June meeting the Licensing Committee believes that it is in the interests of Owners that the decision be taken and announced now that John will be licensed for the 2019/2020 season and will continue to be eligible for licences up to and including the 2023/2024 season.” said Mr Harding. Whyte, 47, will hang up his race-riding boots after the Sha Tin fixture on Sunday, 10 February, in order to take up the Club’s offer to join the trainers’ roster full-time at this season’s end. Sam Clipperton will end his contract with the Hong Kong Jockey Club earlier than expected. He will have his last ride in Hong Kong on Wednesday, January 30 following which he will return to Sydney looking start re-establishing himself immediately with some weekend action. Clipperton landed 62 winners over a two-and-a-half-year spell in Hong Kong but his success graph has gone from forty winners in his first season to just four winners so far this season as his number of opportunities have waned to a disturbing degree. At his peak in Hong Kong Clipperton enjoyed wins at Group 2 and Group 3 level but that Group 1 win remained elusive throughout. It was so close but no cigar as Clipperton did finish as a Group 1 runner-up on no less than four occasions. Clipperton has not ruled out a return to Hong Kong in the future but, for now, he is keen to put himself back on the map in Australia where he plans to ride at least four times a week. Regan Bayliss has been granted a three-month riding contract in Hong Kong. The Hong Kong Jockey Club in fact granted two short-term contracts, one to Bayliss and the other to Irish-jockey Martin Harley, as replacements for Sam Clipperton (who is returning to Australia) and South African rider Callan Murray (who chose not apply for an extension of his current license). Harley’s license runs from 7 February 2019 to 7 May 2019.